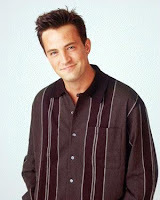 Chandler Bing is an unusual name. And, when you remember that his middle name is Muriel, it's even stranger. I was watching old episodes of Friends the other day, and saw the episode where Phoebe is trying to pick a name for the third triplet, believed to be a boy. Joey and Chandler are both lobbying for her to pick their name, and Joey tells Chandler how his name isn't even word... it's close to "chandelier," but not really. Have you ever met a person named Chandler? Would you consider it as a name for your offspring? I have a friend who named her dog Chandler, but I don't know any real people who share the name!